Credit Card Rates Stable - How Long Will It Last? Credit card rates stable: How long will it last? There were no changes in any of the credit card offers surveyed by IndexCreditCards.com, but beneath that apparent calm, events are unfolding that could spark a new wave of changes in credit card rates in the weeks ahead. Two key events that could soon affect credit card rates are unrest in North Africa and the Middle East and implementation of the Durbin amendment to the Dodd-Frank financial reform legislation. Unrest in the Middle East has sent the price of oil sharply higher. The more this starts to create inflation pressures, the more difficult it will be for the Federal Reserve to keep from raising the bank prime rate from the current 3.25 percent, and many credit card rates are based upon that prime rate. Meanwhile, the Durbin amendment is due to be implemented in April, and threatens the profitability of debit cards. This legislation is specifically targeted at interchange rates on debit cards, not credit cards, but trying to squeeze the profitability out of a financial institution is often like squeezing one end of a balloon--it simply shifts things somewhere else. If debit card profitability is stifled, then banks will look to make up for it somewhere else, and credit card rates or fees are possibilities. Consumer credit card rates remained at 16.82 percent overall, with the average rate on non-reward credit cards at 15.27 percent, and the average rate for reward credit cards at 17.48 percent. That contrast between the reward and non-reward rates represents an important choice for consumers. In essence, the higher interest rate on reward credit cards subsidizes the cost of those rewards. Deciding which is best depends on a consumer's financial habits. For those who diligently pay off their full credit card balance on time every month, the decision is a no-brainer--the interest rate in those cases is a non-factor, so these consumers can reap the benefits of a rewards card without being affected by higher rates. For those who regularly pay interest on a credit card balance, the decision involves the trickier matter of trying to calculate the cash value of rewards received, and comparing that to the extra interest paid for a reward card. With no change to the business credit card offers surveyed, average rates remained stable at 14.72 percent in the non-reward category, and 16.21 percent in the reward category. The difference between non-reward and reward credit card rates is less in the business category than it is in the consumer category. In theory, this would make reward credit card offers more attractive to businesses than to individual consumers, but businesses do have the complication of working out policies on how credit card rewards are to be accrued and redeemed if a card is used by multiple employees. Reward credit card offers are most valuable to businesses that pay off their credit cards in full and on time, and thus can benefit from rewards without paying a higher interest rate. Student credit card rates remained stable at an average of 16.40 percent. This is fairly comparable to general consumer rates (i.e., it is higher than the average non-reward rate, but lower than the average reward rate), so it represents a reasonable opportunity for students to start to establish a credit history. With no change in credit card offers generally, the difference between average rates for customers with good credit and those with not-so-good credit remained the same. 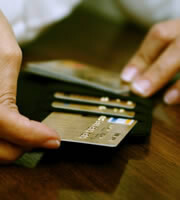 For consumer credit card offers overall, this differential remains at 4.03 percent. In total, IndexCreditCards.com surveys information from some 50 different credit cards, and includes multiple credit-rating tiers from many of those cards. Examples of institutions surveyed include Bank of America, HSBC, Citi, American Express, and Capital One. The information compiled not only demonstrates trends in credit card rates over time, but also indicates the different values credit card companies put on different target markets (consumer, business, etc. ), as evidenced in the differences between rates for those markets. 0 Responses to "Credit card rates stable: How long will it last?"